Writing a blog once a week isn’t that bad during football season but man a lot can happen during a NBA playoff run. Just last week, yours truly and the city at large was happy that the New Orleans Pelicans took a big Game One victory over the Portland Trailblazers. 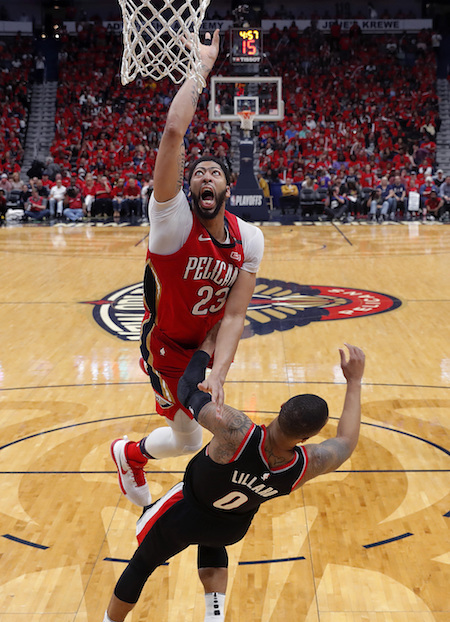 Today, well nothing is really happening for New Orleans because the Pelicans went out and stomped Portland, sweeping them out of the playoffs. I wonder if Anthony Davis is walking around the Quarter because he’s bored today? Honestly, it could happen. The Pelicans have some time off as they wait for everyone else to finish up their first-round series. So, if you see a bunch of tall guys at Tracey’s Pub watching the Golden State Warriors versus San Antonio Spurs tonight you should check to see if one has a unibrow and have your autograph book on the ready. Giddy happiness aside, the Warriors will most likely be the next series’ opponent as there just doesn’t seem to be any way for the Spurs to take the next three games, even without Stephen Curry on the floor. That sets up one heck of an obstacle for the Pelicans. The Warriors have just had the Pelicans number. In 2015, the Warriors swept the Pelicans out of the playoffs on their way to a NBA championship. The following two seasons would see the Pelicans go without a victory in seven matchups with Golden State. This year, the Pelicans finally got a victory over the Warriors in the final game of the year, winning a 126-120 shootout. It should be noted, that Curry didn’t play in the game. So that boils down to a lot of losses against arguably the best team in the league. But sports aren’t ruled by cold logic, sometimes magic creeps in and steals the day. The Pelicans will need some good luck but let’s not pretend they’re showing up empty-handed. Anthony Davis is having a MVP year and averaging 33 points and 12 rebounds a game in the playoffs. Jrue Holiday seems to only have ice in his veins and dropped dagger after dagger on the Trail Blazers. “Playoff Rondo” was trending earlier this week on New Orleans’ Twitter as the veteran seemed to recapture his old Boston Celtics’ form while running circles around the Portland defenders. So, lets throw out what the critics say and dream impossible dreams, shall we? After all, out of 22 ESPN analysts, every single one picked the Trail Blazers to win. So, kick back and relax and enjoy the Pelicans’ success. It’s been a hard-fought season and everyone deserves a little break every now and then. Yes, I do pay attention to other sports as well. If I didn’t how could I tell you that Tulane just chalked up an American Athletic Conference championship? That’s right Greenies, Tulane took the men’s tennis title this weekend in pretty dramatic fashion. For one, even though Tulane entered the championship match versus the USF Bulls as the higher seed, it was the Bulls playing the role of Goliath, having won the past four conference titles and entered the match undefeated in tournament play at 14-0. Yet, Tulane (18-6) was no David either. The Green Wave, at the two-seed, entered the tournament on a four-game win streak and rank 27th in the country. This club also waxed the USF Bulls 6-1 in the final regular season match. However, it wasn’t a cakewalk to the title. USF, on a year that would see them go 10-16, roared back to life in the tournament, upsetting Wichita State and the top-ranked Memphis Tigers on the way to the championship match. Tulane, in their first AAC championship appearance, tried to knock out the Bulls early, jumping out to a 3-1 lead on the day after victories by Constantin Schmitz and Hamish Stewart but the Bulls’ players had never tasted AAC tournament defeat and didn’t go quietly, taking the next two matches to tie it up. It all came down to Tulane’s Tim Ruetzel and the sophomore from Munich, Germany delivered. Ruetzel quickly snatched the first set 6-3 but would have to fight for every inch the rest of the way. USF’s Sean Burnette would win the second set and well, set up, a winner-take-all finale. In the end, on a great volley, Ruetzel drove one past Burnette and the ball dropped inside the line for a 7-5 victory for Ruetzel and the party was on as the Green Wave team stormed the court. Tulane Men's Tennis now moves on to the NCAA tournament and will learn its destination on May 1. It’s make-or-break time for the Tulane Green Wave (19-22) as the next seven games could be the boost the team needs or just more of the same on the way to a so-so season. Tulane hosts Texas Southern tonight at Turchin Stadium before travelling to UConn (22-12-1) for the weekend. Next week, the Green Wave will travel to Southern Miss (28-11) in a rough mid-week matchup before entertaining possibly the best team in the AAC, the East Carolina Pirates (30-9), on the weekend. Buckle up, Uptown.